Skippable TrueView in-stream ads: These appear before, during, or after YouTube videos. The advertiser pays if the user interacts with the video, watches 30 seconds of it, or watches the entire video ad (if it’s shorter than 30 seconds). TrueView video discovery ads: These appear next to related YouTube videos, on the YouTube mobile homepage, or in YouTube search results. The advertiser pays when the user clicks on the video thumbnail. Bumper ads: These are non-skippable, 6-second ads. The advertiser pays per 1,000 impressions. 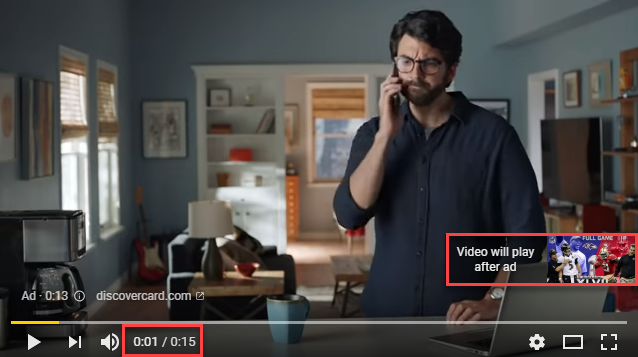 Another format that we see on YouTube fairly often is 15 second non-skippable ads. These have only been available to advertisers via a reserved media placement on YouTube, which often involves a minimum spend and more work than the typical YouTube campaign. This format hasn’t been available to advertisers via the auction. However, Google recently announced that they’ll be expanding use of these 15-second non-skippable ads to all advertisers on Google Ads, display and video 360 participating in auctions. With this update, advertisers now have another creative option and aren’t limited to just TrueView ads or non-skippable bumper ads. Google says that they want to make the buying experience more flexible and intuitive and give advertisers access to all video ad formats, regardless of how they buy. When should you use the new format? Are you currently running a YouTube campaign, or getting ready to launch one in the future? 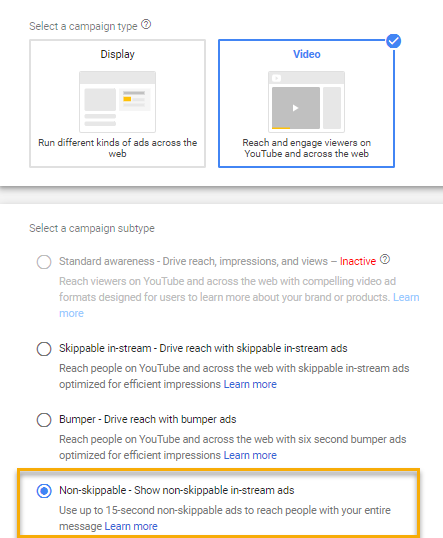 Non-skippable ads are great to use when an advertiser wants to deliver an entire message to the viewer, but consider testing out the new format with bumper and TrueView In-Stream ads as well. Depending on the campaign goal and targeted audience, different creative lengths and viewer experiences can lead to different results. Additionally, since CPMs will likely be higher for this format, advertisers should make sure that their message is clear and compelling and that their targeting methods are reaching viewers who fit their target audience. Looking for more tips and tricks on running YouTube campaigns, optimizing videos for search, or tracking YouTube success? Check out our full YouTube Video Marketing Guide!